In 2015, a 12th century book of the Gospels began to get attention from the media. The reason for the attention was that the first page of this book contained a mysterious chart of concentric circles with words written on it in Latin. People began calling it “the prayer wheel” and now there is even a book about how to use it. This particular prayer wheel has four rings that surround the center circle with the word “God” in it. The outermost ring says that the purpose of the wheel is to “teach the return home.” The second ring contains 7 petitions of the Lord’s Prayer. The next ring contains 7 events in Jesus’ life and 7 attributes of the Spirit mentioned in Isaiah 11:2-3. The final ring has the beatitudes, with the promise of each beatitude on the other side of the God circle. How Did Christians Use It? There’s a lot of mystery still surrounding how medieval Christians used this, but it appears that everyone’s best guess is to start on the outside and pray for each item as you move towards the center God circle. For example, if you start with the top path, the items to pray about are: (1) Holy Name, or “Hallowed be your name” from the Lord’s Prayer, (2) the Incarnation of Jesus, (3) the Wisdom of the Spirit, and (4) the beatitude “Blessed are the peacemakers, for they will be called children of God” (Matthew 5:9). Step 1: Pray that God’s name would be hallowed. Step 2: Meditate on the Incarnation and what it means for us that God became a man. Step 3: Seek the wisdom that comes from the Holy Spirit. Step 4: Ask the Lord to help you be a peacemaker, and trust in the promise of being called a child of God. So if you look at it this way, all the prayer wheel does is take biblical content and turn it into a visual aid for prayer. When seen from this point of view, I don’t think there is anything magical or mystical about the prayer wheel. If using this kind of tool helps you to pray for biblical things, then I don’t see a problem with it. In fact, I have started using one myself and I have really enjoyed it! My prayer wheel has four rings. The outermost ring contains the 8 petitions of the Lord’s prayer. The second ring contains the 8 commands listed in James 4:7-10. The next ring contains the 8 things to mediate on listed in Philippians 4:8. The last ring contains the 8 virtues to grow in taken from 2 Peter 1:5-7. My center circle also has “God” in it. So here is what my prayer time looked like for the second path, “Hallowed Be Your Name.” First, I prayed that I would live in such a way where others would see God’s holy name demonstrated through my life. Second, I asked God to help me resist Satan’s schemes and I reflected on the possible ways that I am experiencing attack from the enemy. Third, I reflected on things that were honorable, such as how Jesus lived his life in humility and service to others. Lastly, I prayed that God would help me become a more virtuous person by following the example of Christ. Now it’s your turn. What do you think of something like this? 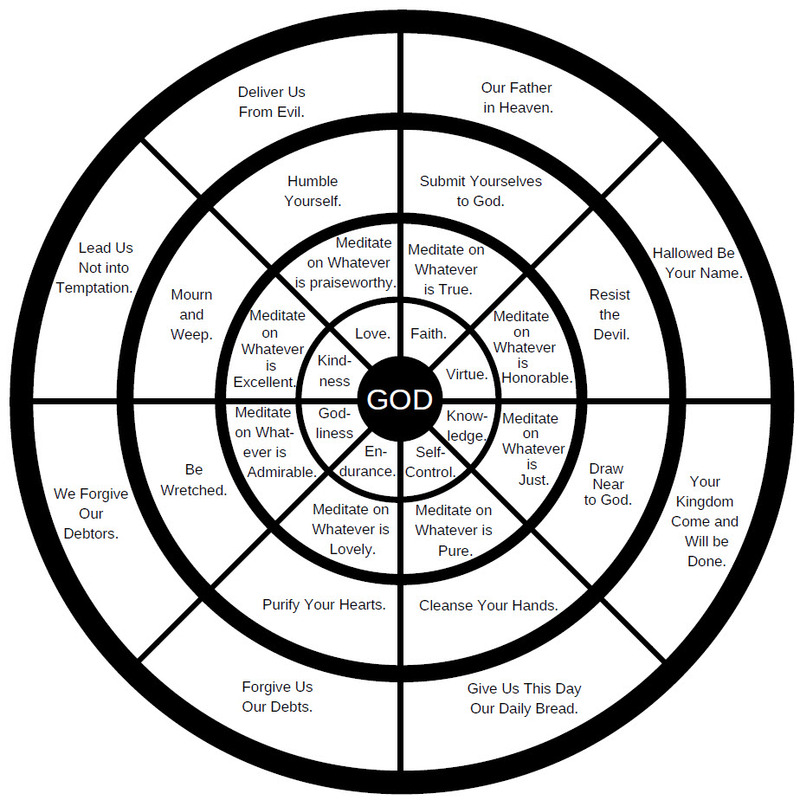 Are visual aids like this helpful in your prayer life?